The architectural pillar form and glorious seasonal colour make this an underused hero in the garden! Populus tremula 'Erecta' is a remarkably columnar tree that will grow to approximately 8 x 1 metres in 20 years with its narrow form drawing the eye in. 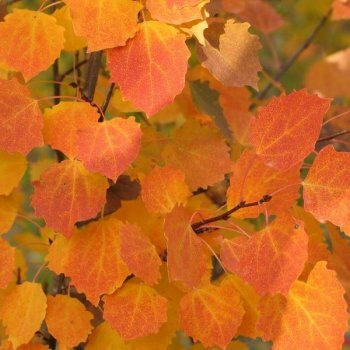 The small, pointed, heart-shaped foliage is mid-green throughout the spring and summer and rustles pleasantly in a breeze, turning vibrant shades of orange, yellow and red in the autumn. First discovered in a Swedish woodland, hence the common name Swedish Columnar Aspen, it also goes by the names Upright Aspen and Populus tremuloides 'Erecta'. It looks striking when planted in an avenue at close proximity, but equally its columnar form makes it ideal for tight spaces where upright interest or screening is required. Coastal positions and inland exposure aren’t a problem and it is also hardy. Populus tremula 'Erecta' is a delightful specimen tree with many uses which will reward you with its fiery seasonal colour. Our pot grown Swedish Columnar Aspen trees can be planted at any time of the year, unlike bare root trees. Start by removing weeds and grass within a metre of your intended planting hole. Dig a square hole as deep as your root mass and approximately 2x as wide. To help your tree establish more effectively, especially if you have poor soil, we advise sprinkling root grow in the hole. If you’re planting in spring, summer or dry weather, water well and regularly for the first few months. Make sure to keep an eye on young Swedish Columnar Aspen trees and increase watering if there are extended periods of hot or dry weather. If you’re planting in autumn, you may only need to water your tree a little. We stock a range of irrigation kits, suitable for a variety of planting schemes. The natural habit of a Swedish Upright Poplar tree creates an attractive canopy that does not require a lot of maintenance. You can tip trim the branches in spring, after flowering, to encourage healthy growth. Any lower branches and suckers should be removed to form a clear stem. Poplar trees do not take well to hard pruning, so avoid cutting your populus tree back severely.